Happy New Year! Here’s what we’ve got planned for this month, plus there is the possibility of a few surprise giveaways thrown in! What’s your New Year’s Resolution for your pet this year? Have you stuck to it so far? Let us know how you plan to improve your pet’s life this year to be entered into this week’s giveaway! One random winner, announced January 14, 2011, will receive a $25 gift card! Honorable mentions will be featured on our blog. We have anywhere from 3 to 17 dogs in the Trupanion office on a daily basis. Your task is to guess how many dogs are in the office on Wednesday, January 19, 2011! Whoever guesses correctly will win a $25 gift card! If more than one person guess the correct number, the winner will be chosen from a random shuffle of correct guesses. Winner will be announced via Facebook on Wednesday, January 19, 2011. It’s Winter and it’s cold outside (for many of us). We’d like to see how your pets are keeping warm and cozy! 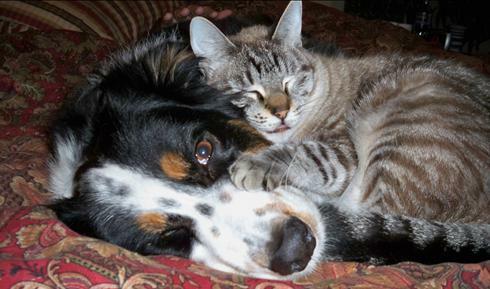 Post a picture of your pet snuggling, sleeping, bundled up, or any picture that you think represents a cozy pet. One random winner will receive a $25 gift card and our favorites will be featured on our blog as honorable mentions! Winner announced Friday, January 28, 2011.